Gibson Vintage Guitar General Info, Specs, and Serial Numbers. Gibson vintage guitars history and collecting. Private vintage guitar collector. Pictures, history for gibson vintage guitars. Introduction and "What type of Gibson guitar do I have?" Mandolin, Mandola, Mandocello Model Information. The type of guitar (flattop, archtop, solidbody, lapsteel, etc). The exact model within the type. The year it was made (or approximate year/era). Oringinality (have any of the parts been changed or modified?). First Determine the Type of Guitar and the Model. Sometimes there is a tag inside the guitar stating the "style" or model. If the model is hollow, look on the inside for any tags and made note of any ink stamps (sometimes the model is ink stamped inside the guitar). But unfortunately, especially on the low to mid line models, usually there is NO tag or label inside the guitar specifying what it is. If this is the case, start at the beginning and first determine what type of guitar you have. These are several different types of Gibson guitars made. Once this is known, go directly to the section about that type (listed in the blue table of contents text above), and look at the model pictures and descriptions that matches your guitar. Electric Solid body Gibsons: body is a solid piece of wood (no soundhole or cutouts), 1.5" to 2" thick, pickups and knobs routed into the top of the guitar. Flattop Acoustic Gibsons: single round sound hole under the strings, body 3.5" to 4.5" thick with a flat top, usually not electric (but often owners add a sort of bolt-on electric assembly). Acoustic Archtop Gibsons: two "f" hole style sound holes cut in the top, body 3" to 4.5" thick, slightly arched top, acoustic with no pickups (but sometimes these models have bolt-on electic assembly added later by players). Electric Archtop Gibsons: same as above ("f" holes, arch top) but the factory installed electric pickups into the guitar with volume/tone knob(s). Electric Thinline Archtop Gibsons: same as above (electric with two "f" holes in the top), but the body is thinner at 1.5" to 2" thick. These are always electric from the factory. Electric Lapsteel Gibson: a small solidbody guitar (no cutouts or sound holes) that is played in the lap, Hawaiian style, with a metal slide bar, pickup and knob routed into the top. Once the type of guitar is determined, figuring out the exact model is MUCH easier! (just go to one of the above six linked webpages that describes your guitar, and compare each model specs to your guitar, until you find the one that matches). Next Determine the Year or Approximate Year. Probably the first thing when trying to determine the year on an old Gibson is whether the guitar was made "pre-WW2", during WW2, or "post-WW2". This is easy to do, as Gibson used different peghead logos for pre-WW2, "wartime", and post-WW2 (see the General Specs section for more details). Knowing the general era of the Gibson guitar will make Gibson's rather complicated serial number/FON systems less tangled. Next Determine the Exact Model. What is the color of the top of the guitar? Common top colors include "sunburst" (a yellow center that fades to a darker red or brown around the edges), black, natural and "cherry red" (a translucent red which shows the wood grain). What is the color of the back of the guitar? Common back colors include translucent dark brown, translucent light brown, sunburst, cherry red, etc. What is the body size? (measure the guitar across the top at the widest point, which is the guitar's "hips"). This is really important for all model types except solidbody electrics. What is the style of "Gibson" peghead logo? That is, is it white silkscreen, gold silkscreen, or pearl inlay? Also if the logo is pre-WW2, wartime, or post-WW2 (see above). Also fancier models can even have some sort of pearl inlaid decoration (a "crown" or long skinny "diamond") on the peghead just below the "Gibson" logo. What is the style of binding? Binding is the whitish/yellowish/tortoise "band" that goes around the edges of the body. 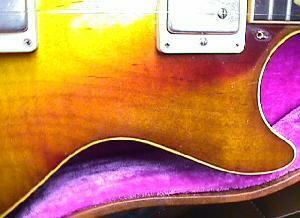 Most Gibsons have some sort of body binding. Often binding is multi-layers (white/black/white, etc). Some guitars also have binding on the neck. The more binding a guitar has, the fancier the model. Originality of an instrument is very important. Modifications (any modifications), are a bad thing in the eyes of a collector. This will greatly influence value. Modifications can often be determined by looking at the model specs for a particular year guitar in this web page (after the approximate year is determined), and compare to your instrument. Gibson invented the archtop guitar as we know it and has remained one of the better makers. The most collectible Gibson archtops are the larger models made from the early 1930's to 1959. The Advance (17" or wider) models from late 1934 onward are of the same construction used in today's archtops. The Lloyd Loar signed L-5's, the pre-war Super 400, and Advanced L-5 archtops are highly collectible. The pre-war cutaway L-5 and cutaway Super 400 are also known as Premier models. Non-cutaway models are not nearly as collectible as cutaway Premier models. Cutaway archtop models made from 1946 to 1959 are also very collectible, but are not as much as the pre-war Advance Premier models. Non-cutaway post-war models are interesting but not very collectible. Archtop cutaway models made from 1960 to 1969 are also very good instruments, but are not nearly as collectible as the pre-1960 models and are more utility instruments. Gibson began to develop professional quality flat top instrument in the 1930's. Many concepts were stolen from Martin, which was the company that invented features such as X-braced tops and large dreadnought body sizes. Gibson then modified Martin's designs and developed its own improvements including adjustable truss rods, adjustable saddle(s), and super jumbo body shapes. Although workmanship on pre-war Gibsons is not as high as pre-war Martins, Gibson flat tops are well designed and constructed so they have excellent tone. Many player (including me) prefer Gibsons of this period to all other flat tops. Flat tops of the 1940's and 1950's are also excellent instruments. Since they are much more common, they are also easier and less expensive to obtain. Gibson flat tops of the 1960's and 1970's seem to be inferior in tone and construction to the same models of the 1950's. This is generally blamed on adjustable bridges that were standard on all models in the 1960's. Also the end of "sloped" shoulder body styles helped alienate players and collector alike. Vintage Electric Arch top Gibson Collectibility. Pre-war Gibson electric arch tops are excellent instruments. Since pre-war models are early in the evolution of the electric guitar, they are historically important. The ES-150 and ES-250, both used by Charlie Christian, are very collectible pre-war instruments. Postwar full depth, non-cutaway models were generally designed as student models and are not very valuable. Post-war Gison electric archtops with cutaways from the 1950's are considered to be excellent and collectible. The deluxe models, such as the L-5CES, Super 400CES from the 1950's are very collectible. The laminated body models, such as the ES-5, ES-350, ES-175 and ES-295 are not worth as much as the solid wood model, but are valuable. Vintage Electric Thinline Archtop Gibson Collectibility. There are two styles of Thinline Gibson models. First is the "fully hollowbody" style. These thinline, fully hollow, models are somewhat collectible. The single cutaway Byrdland (a short scale, thin body L-5CES) is excellent in quality, but its short scale length and narrow neck makes it less collectible. The single cutaway ES-350T (a plainer version of the Byrdland), having the same problems, also has limited collectibility mostly due to its scale length. Fully hollow thinlines such as the double cutaway ES-330 never had the appeal or utility of the semi-hollow counterparts such as the ES-335. Thinline, semi-hollow electrics from 1958 to 1964 are very cool and wanted by players and collectors. The ES-335, which had the lowest list price of the ES-335/ ES-345/ ES-355 group, is considered to be the most collectible (even though it is the plainest). The Varitone/Stereo system of the ES-345/ES-355 is less desirable than the simple ES-335 design. Also, the stop tailpiece setup of the ES-335 is more collectible than the vibrato or trapeze tailpiece systems. Vintage Electric Solid body Gibson Collectibility. The Les Paul models from the 1950's along with the Korina Flying V and Explorer are some of the most collectible solidbody production guitars. Les Paul models with Humbucking pickups from the 1950's are the most desired, with the P-90 pickup models selling for significantly less money. Original series Firebirds with full reverse bodies are also very collectible. Other solidbody gibson may have some appeal, but not to the extent of the previously mentioned models. Vintage Double neck Gibson Collectibility. Double neck models with carved spruce tops are different than any other Gibson design. Because of this they are collectible. Solidbody double neck SG style guitars are not nearly as desirable, though popularized by bands such as Led Zeppelin in the 1970s. Vintage Gibson Electric Bass Collectibility. Generally speaking, Gibson doesn't have much of a reputation as an electric bass maker. Though the first electric Gibson bass introduced in 1953 (known as the EB-1) is interesting, it's not desirable to the player. The late fifties EB-2 and EB-6 are also interesting, but don't appeal widely to players. Likewise the Thunderbird II and IV basses are nice companions to the Firebird guitars, but again don't appeal to players. Because of this, the collectibility of Gibson basses is somewhat limited, especially when compared to Fender electric basses. Gibson ukes, though not as collectible as Martin ukes, has a certain charm. Although I do not list Gibson uke models here, please email me if you have a Gibson uke you are interested in selling. Although lapsteels are considered student model instruments, pre-war models are interesting. This is because they are early examples in the evolution of the electric guitar. Today, the pedal steel has made the lapsteel obsolete. Gibson mandolins are the standard of the industry. The original 1902 series made by Orville Gibson generally don't sound that good, but are interesting historically. Mandolins from 1904 to 1909 have a better design, but still lack sound. The high end models from 1910 to 1922 are excellent utility mandolins. The F-5 design of the mid 1920's is considered to be high point of mandolin design, and the mandolin by which all others are judged. By the late 1920's, the mandolin boom had pasted and demand feel. Because demand was low, so was production. Hence mandolins from the 1930's are somewhat rare. Until the mandolin became popular in country music after WWII, demand and production for mandolins stayed low. "Snakehead" peghead, narrows towards top: 1923-1934. Discontinued all models except L-5 by 1927. Discontinued L-5 1934. Fiber peghead veneer replaces "Holly" wood veneer: 1970 to present. Also "Made in U.S.A." impressed in back of peghead or on decal. Peghead angle is 17 degrees: 1904-1966. Peghead angle is 14 degrees: 1966-1983 (approximately). Peghead angle is 17 degrees: 1983-present. "Volute" on back of peghead (most models): 1969 to 1981. Thickness of peghead uniform: 1955-present. Prior to 1955 peghead narrows in thickness towards top. Fingerboards, bridges and other small parts made from rosewood are all the Brazilian variety till 1966. Starting in 1966, Gibson changed to Indian rosewood. Left: Pre-WW2 pearl script logo. Note no letters drop below the other letters. Middle: Post-WW2 pearl 1948-1951 style logo with connecting dot. The "G" and the "n" drop below the other letters, and the open "b" and open "o" (open at the top of the letters) were used in their pearl logos until 1969. Right: "Pantograph" logo used from 1969 to 1984. Note the closed "b" and "o". Gibson used a smaller .070" wide frets until about 1959. Then the width changed to .100". This happened to pretty much all models at some point in 1959. There were some exceptions though, like the Les Paul Custom (which kept the smaller .070" wide frets, as it was labeled the "fretless wonder"). 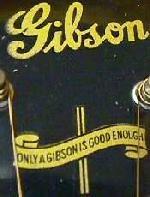 Pre-war Gibson script logo used before 1948. No letters drops below the other letters. Pre-war Script Gibson logo, Pearl or White. "The Gibson" slanted or straight (depends on model): 1908-1929. 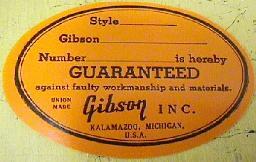 "Gibson" logo transition (without "The"), varies by model: 1928-1934. White silkscreen, low-end models: 1928-1943. Thicker "Gibson" on Super 400 and other high-end models: mid 1930's. Thicker "Gibson" all models: late 1930's. was always attached on all of these post-war gold logos. from 1951 to 1969, and again from 1985 to present. Right: War-time gold script "only a Gibson is Good Enough"
logo on a Southern Jumbo, as used from 1943 to 1945. All models made during WW2. Post-war block Gibson logo, Pearl or Gold. "Post-war" Gibson block logo used 1948-present. The post-war logo has the "G" and the "N" with a tail that drops below the other letters. Gibson always used nitrocellulose lacquer for all instruments from 1925 to present. The standard colors for most instruments was Sunburst, Natural, black, white, cherry red, (Les Paul) TV yellow, or (Les Paul) gold. Some other special order custom colors were available. 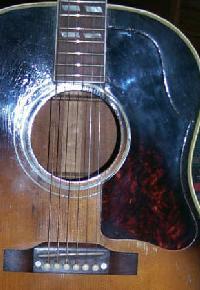 Prior to 1925, Gibson used mostly spirit varnish. The spirit varnish was a combination of shellac (blonde or orange/seedlac) and small amounts of alcohol (spirit). This is very similar to Behlen's Violin Varnish (still available today.) This spirit varnish produces a eggshell crazing patina. Around 1918 is when Gibson started experimenting with Nitrocellulose laquer, and by 1925 all models were using lacquer. In 1918 the lacquer experimentation process began on less expensive models like the opaque white top A3, L3, and Sheraton Brown "A" models. Note that all staining was done with water based aniline dyes directly on the wood. During the early 1920s, Gibson also used a oil/spirit combination finish on higher end instruments. For example some Lloyd Loar mandolins had this finish. This was short lived though. A faded sunburst on a 1959 Les Paul Standard. by the neck pickup pickguard attachment point. During the late 1950's, the red ainline used in their sunburst finishes often faded. This problem was fixed by mid-1960, though sometimes you see it on later 1960's models. Left: Oval white label as used from spring 1947 to January 1955. Right: Orange label as used from January 1955 to 1964. The 1964 to 1969 orange labels are identical, except for the added text "union made". Note the faint ink stamp along the bottom of the label denoting "STEREO VARITONE" (though non-union made labels are seen later). Left: Orange "union made" label as used from 1964 to 1969. Note the "union made" designation to the left of the "Gibson" insignia. When Gibson was bought by Norlin in 1969, thousands of these labels were discarded (and replaced with white and purple "Norlin" labels). These blank unused labels were snatched up by many guitar dealers, and are still available today. Rigth: White label used from 1908 to 1932. This particular label is from a 1929 L-4 model. Rectangular label, no serial number or model name on label, photo of Orville Gibson and lyre-mandolin on label, date sometimes penciled under top: 1902 to 1904. Oval label with serial number, no model name, photo of Orville Gibson and lyre-mandolin: 1904 to 1909. White label with number and model name, number range 0100 to 99999. Hand ink or penciled (some overlap with previous style): 1908 to 1932. White label with number and model name Ink stamped: 1932 to 1947. White oval label with number preceded by "A-": spring 1947 to January 1955. The first number, A-100, was assigned to an L-7 on 4/28/47. The last white label number was A-18750, used 1/12/55. Note white label numbers A-18751 to A-20000 were not used. Orange oval label with number preceded by an "A": Jan 1955 to 1961. The first orange label number, A20001, was used on a F-5 mandolin 01/13/55. The last orange label "A" number was A36147, used 2/21/61. Note the "-" after the "A" was dropped for the orange labels. Orange oval label with number matching number on back of headstock (number range 100 to 999999): 1961 to 1969. "Union Made" added to orange label: 1964 to 1969 (intermixed). Don't read too much into a label that has (or does not have) "union made", as both label types were used throughout the 1960s. White rectangle "Norlin" label with black and purple triangles: 1970 to 1984. Tops: Before WW2, tops on electric archtops are solid spruce. After WW2, all models except the L-5CES, Byrdland, Super 400CES and floating pickup models (like the Johnny Smith) are laminated maple tops to prevent feedback. Back and Sides: Before WW2, back and sides are solid maple. After WW2, all models except the L-5CES, Byrdland, Super 400CES use laminated maple. From 1960 to 1969, all models including the above use laminated maple back and sides. 1970's style neck with a volute. Also note the "made in USA" stamp. Pre-WW2: Prior to WW2, many models have a distinctive "V" shape. Most necks were 1 3/4" wide measured across the nut. WW2-1959: Known as "baseball bats" due to the large back size. Just after the war Gibson settled on 1 11/16" as their standard neck width measured across the nut. The 1959 era necks are often considered the best of this era; large and comfortable without being huge. 1960-1962: Thin neck back shape, even compared to today's standards these necks don't have much wood behind the fingerboard and feel very thin. 1963-1964: Larger neck shape, but still smaller than the 1950's "baseball bat" style. 1965-1967: Most models have nut width dramatically reduced making the neck feel very small. Back shape is about the same as the 1963-1964 era, but the narrow nut width makes these necks feel like "pencil necks". The pre-1965 neck width is around 1 11/16". The 1965 to 1967 neck width is 1 9/16" or 1 5/8". 1968-present: Nut width increased back to 1 11/16" and back shape changed to 1963-1964 standards. 1970: Volute added to back of neck behind the nut. Nut & Saddle material: Gibson nuts and saddles of Nylon 6/6. Nylon, a thermoplastic material, was invented in 1935 by Wallace Carothers at DuPont. Type 6/6 Nylon 101 is the most common commercial grade of Nylon and its natural color is off-white. Also Gibson was rumored to use Dupont Delrin as their nut/saddle material, but frankly I don't think that is correct. 2 pearl dots on bridge: early 1940's-1960's. Retangular bridge, most models: WW2. Martin-type belly bridge, some banner-logo examples: WW2. Upper belly bridge (above bridge pins): early 1950's-1969. Plastic bridge, most models below SJ: 1963-1964. Indian Rosewood used instead of Brazilian: 1966. Lower belly bridge (below bridge pins): 1969-1984. Upper belly bridge (above bridge pins): 1984-present. Option on J-45, J-50, SJ: 1956-1960. Standard on most models: 1961-1970. 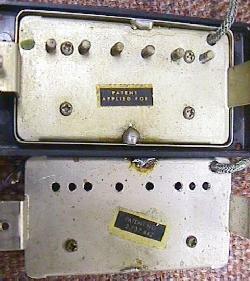 Left: wrap-around "uncompensated" smooth stud bridge/tailpiece unit on a 1960 Les Paul TV Special (note the black covered P-90 "soapbar" pickup). 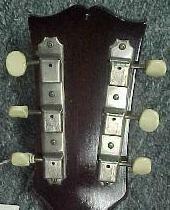 This style bridge/tailpiece was used from 1953 to 1961. In 1961, it changed to a "compensated" style unit with "stairsteps" for each string. Right: tunematic bridge ("no wire") and stop tailpiece on a 1957 goldtop Les Paul (note the partial shown white covered P-90 "soapbar" pickup at the bottom of the picture). Tunematic bridges started showing up on many Gibson models in 1955. Bridge/tailpiece, Solidbody and Electric Archtop models. 1952: "Les Paul" stamped trapeze tailpiece. Used on some models (ES-225 and ES-295) until 1958. 1953: Wrap around stud bridge/tailpiece combination unit used on only solidbody models. Ears on tailpiece 3/16" thick and often cracked at the intonation adjustment screw. early 1955: Wrap around stud bridge/tailpiece combination ears increased in thickness from 3/16" to 1/4" to prevent breakage. This tailpiece was used until the 1970's on some models including the SG Junior. 1956: metal threaded inserts for the wrap-around and stop tailpieces increase in length from 1/2" to 3/4". This was an important change on wrap around tailpieces, because it stopped the wrap-around from leaning forward and cracking the body wood (often seen on 1954-1955 Les Paul Juniors and Specials). 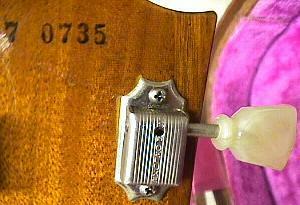 1954: Tunematic bridge ("no wire", stamped underneath "ABR-1", metal saddles) and stop tailpiece. First appeared on the Les Paul Custom in 1954, and the Les Paul Standard in 1955. Many electric archtop models also converted to the tunematic bridge. Only the Les Paul Junior and Special (and later Melody Maker) continue to use the previous wraparound stud tailpiece. 1961: Stud wraparound tailpiece unit (as used only on the lower-end models like the SG Junior at this point) now have compensated "stair steps" cast into the unit. 1962: Tunematic bridge "with wire" (still stamped "ABR-1" on bottom). The wire goes over the six saddle screw heads to prevent the saddles from popping out during string changes. 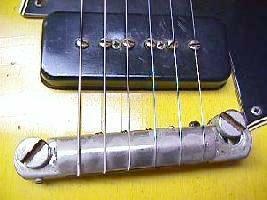 1963/1964: Tunematic bridge uses white nylon saddles instead of nickel plated brass saddles. 1965: Tunematic bridge now chrome plated, no longer stamped "ABR-1" on bottom (replaced by casted patent number). Stop tailpiece now chrome plated too, and replaced on many models (like the ES-335) with a trapeze tailpiece. 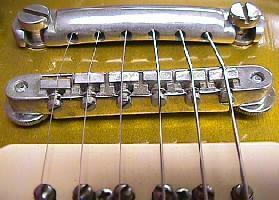 1966: Metal saddles replace the nylon saddles on the tunematic bridge. pickup (with metal cover removed). 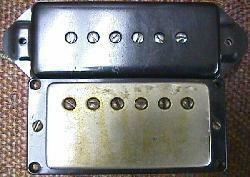 pickup with a nickel plated cover (bottom). Alnico V pickup. Looks like a P-90 soapbar pickup, except has "staple" poles with adjusting screws next to the poles. Used on upper line models: 1954-1957.
and its steel mounting screws. bottom showing its patent number decal. Humbucking pickup. two internal coils below a 1.5" x 2.75" metal cover. One row of 6 adjustable slot-head poles off-center: 1957-present. Cover was gold, nickel or (after 1965) chrome plated. Prior to about mid-1962, have small decal on bottom stating "Patent Applied For". These are known as "P.A.F." pickups. 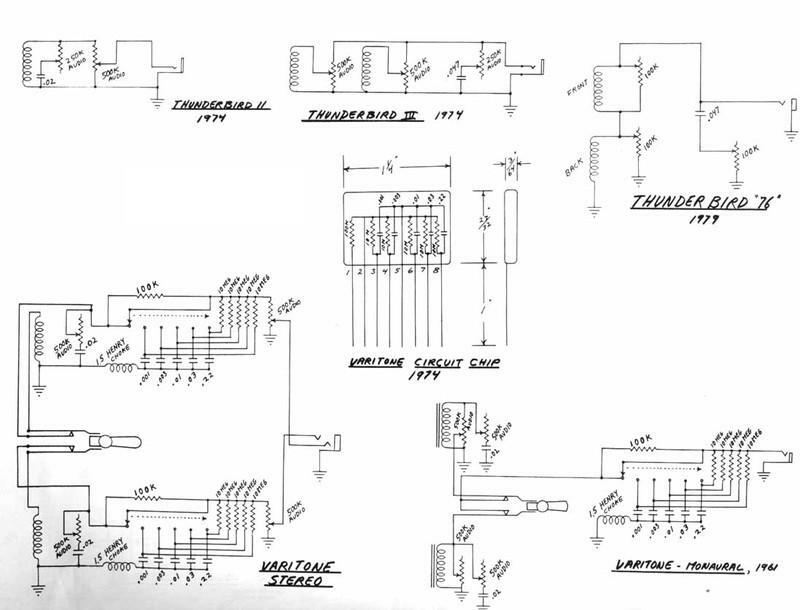 Starting in about mid-1962 to early 1963, a "Patent No." decal replaces the P.A.F. decal. Most 1957 humbucking pickups (first year) have no decal, and a more squarish stainless steel cover. Also 1957 to early 1959 P.A.F. pickups have brass screws holding the plastic bobbins to the metal frame. The internal plastic coil bobbins are usually black plastic, but sometimes they are white (this happened mostly in 1959 or early 1960). You can see the color of the wire bobbins by removing the small underside mounting screw (instead of removing the pickup cover). More information and pictures of PAF pickups can be seen here. had a belly down towards the endpin). Most Gibson pickguards prior to the mid-1970's were made from celluloid. This material can deteriote with time (the tortoise colored pickguards especially exhibit this trait). Flattop pickguards: from the 1930's to 1955, Gibson flattop pickguards were usually "teardrop" in shaped. But in early 1955, most models changed to a "pointed" pickguard that followed the shape of the guitar (except for the point). The J-200 was an exception to this rule; it's pickguard stayed the same shape, but the material and the designed changed. Prior to 1955, the J-200 has an engraved celluloid pickguard. Starting in 1955, this changed to an injection molded styrene pickguard that was cheaper to make. Pickguard Bevels: on Gibsons that used a solid black pickguard, the material was a layered black/white/black/white/black design. The edges were cut beveled to make them look like they had binding. In 1966, the bevel changed from being very wide and flat, to a narrow and steeper cut. Top row: on the left is the first Gibson electric knob as used on ES model guitars from 1947 to early 1950 (no numbers). Next to it is the ugliest pre-1970 Gibson knob, known as the "amp" knob, used from late 1966 to the mid-1970's (but not on all models). Middle row, left to right: Tall numbered gold knob, used from 1950 to 1952, "speed" knob as used from 1953 to 1955, "bonnet" knob as used from 1955 to 1960, "metal top bonnet" knob or "reflector" knob as used from mid-1960 to mid-1970s (on many, but not all models). Bottom row, left to right: switch tips used. The left switch tip was used on multiple pickup models from after WW2 to about 1960. This knob is bakelite and very amber in color. Next to it is the 1960 version where the switch tip changed to a plastic material that stayed white, and had a visible seam. 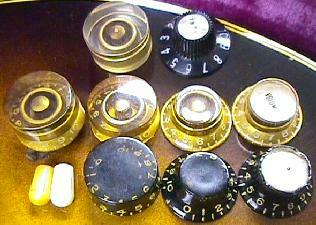 Bottom row black knobs, left to right: depending on the color of the guitar, some models starting in the early 1950's used black versions of the above gold knobs. These correspond to the same years as the above gold versions. Bonnet knob with metal cap ("reflector" knobs): Used from mid-1960 to mid-1970s. Similar to bonnet knob but now has metal cap with "Volume" or "Tone" printed in black on the metal cap. There are two styles of this knob. First was used from mid-1960 to the end of 1961, and have a shallow post hole (as viewed from the side). The 1962 and later relector knob has a deeper post hole (the bottom of the post hole comes much closer to the metal cap). Also the reflector on these knobs can be silver or gold. Guitars with nickel or chrome hardware should have silver caps. Guitars with gold hardware should have gold caps (though often the gold does wear off). Barrel knob. similar to bonnet knobs, but now shaped like a barrel with no metal cap. Back painted gold or black, clear with numbers 1 to 10 visible thru knob: 1968 to present. Note this knob was used primarily on 1968 Les Paul Custom models till the mid 1970's, when most other models got these knobs. Amp knobs. Black knobs with white numbers 1 to 10. Looks like "blackface" Fender amp knobs: late 1966 - mid 1970's. Some models never got these knobs (such as the 1968 and later Les Pauls). Used mostly on the hollowbody and semi-hollow models, such as the ES series. Switch Tips: on guitars with two pickups and a 3-way selector switch, Gibson used an amber-colored bakelite switch tip during the 1950's. Starting in mid-1960, they switched to a much whiter and slightly rounder tip plastic switch tip. Left: 1955 to 1960 bonnet knob. Middle: mid-1960 to 1961 "reflector" knob. Right: 1962 to mid-1970s "reflector" knob. picture by t.witrock. Phillips head screws started to be used at Gibson in 1939 (the phillips head screw was original patented in 1933). Prior to 1939, all screws should be slot style. Prior to 1965, all metal hardware is either nickel or gold plated. Starting in 1965, all hardware is either chrome or gold plated. Left: "3 on a plate" style Kluson tuners, as used on the lower-line Gibson models. Right: Kluson Deluxe "tulip" tuners on a 1957 Les Paul. Note this is the "single ring, single line" variety used from 1955 to 1961. The "single ring" refers to the single ring around the plastic button. The "single line" refers to the single line of vertical text saying "Kluson Deluxe". Note the "inked on" serial number. During the 1950's and 1960's, Gibson used Kluson tuners almost exclusively. There were some exceptions; starting in 1959 you could special order Grover tuners instead of Klusons on many mid to upper line models including the Les Paul Custom and J-200 models. 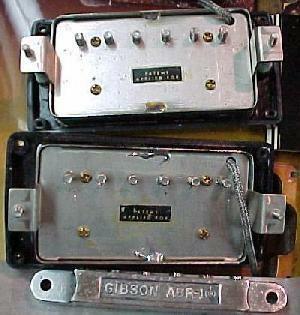 By 1969, Gibson starting using tuners with the "Gibson Deluxe" name on them, but these were actually made by Kluson. More info on Kluson tuners can be found here. Again Phillips head screws started to be used at Gibson in 1939 (the phillips head screw was original patented in 1933). Prior to 1939, all screws should be slot style. "Kluson Deluxe" in a single vertical line on the ribbed metal tuner cover (aka "Single Line"). "PAT. APPLD." stamped on the bottom edge of the cover (viewable without removing tuner from guitar). NO outside hole on the metal cover for the tuner worm shaft. 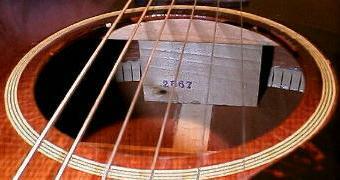 On the bottom side of the tuners stamped into the metal it says "2356766 PAT. APPLD." The exterior lubrication holes can be either small or large, or even no lubrication hole (rare). Tulip plastic tuners knobs have a single ring around them. These tuners are often called "Single Line, Single Ring, No Hole, Pat Applied". "No Line" Kluson tuners with no vertical name marking on the exterior gear cover. The exterior "PAT. APPLD." stamp is gone. Still no outside hole in the metal tuner cover for the tuner worm shaft. The exterior lubrication holes can be either small or large. On the bottom side of the tuners stamped into the metal it says "2356766 PAT. APPLD." Tulip plastic tuners knobs have a single ring around them. These tuners are often called "No Line, Single Ring, No Shaft Hole". "No Line" Kluson tuners with no vertical name marking on the exterior gear cover. There is still now an outside hole in the metal tuner cover for the tuner worm shaft. The exterior lubrication holes can be either small or large. On the bottom side of the tuners stamped into the metal it says "2356766 PAT. APPLD." Tulip plastic tuners knobs have a single ring around them. These tuners are often called "No Line, Single Ring". Single line "Kluson Deluxe" in a single vertical line on the ribbed metal tuner cover. The exterior lubrication holes can be either small or large. On the bottom side of the tuners stamped into the metal it says "2356766 PAT. APPLD." Tulip plastic tuners knobs have a single ring around them. These tuners are often called "Single Line, Single Ring, Pat Appld". Single line "Kluson Deluxe" in a single vertical line on the ribbed metal tuner cover. The exterior lubrication holes can be either small or large (though most are large hole). On the bottom side of the tuners stamped into the metal it says "D-169400 PATENT NO." Tulip plastic tuners knobs have a single ring around them. These tuners are often called "Single Line, Single Ring, Pat Number". Two plastic rings on the plastic "tulip" tuner knob. "Kluson Deluxe" still in a single vertical row. On the bottom side of the tuners stamped into the metal it says "D-169400 PATENT NO." The exterior lubrication holes are the small type. These tuners are often called "Single Line, Double Ring". "Kluson Deluxe" in TWO vertical lines on the ribbed metal tuner cover. On the bottom side of the tuners stamped into the metal it says "D-169400 PATENT NO." The exterior lubrication holes are the large type. On keystone tuners, the buttons become have a slight green tint to them. These tuners are often called "Double Line, Double Ring". Now a double lined "Gibson Deluxe" replaces the double line "Kluson Deluxe". Also the bottom side stamp "D-169400 PATENT NO." is much deeper and bolder. The base plate for the tuners also has a more rounded look to it with the edges less defined. This happened because the dies that stamped out this part were wearing out. The original Kluson tuners company went out of business in 1974 so this style of tuner was not made again until the 1990s when WD Guitar Products bought the Kluson name (and reissued these tuners). Gibson often marked inferior quality guitars as "seconds", and sold them at a discount to dealers or employees. These markings were stamped into the wood on the back of the peghead. A "2" stamp is sometimes seen, designating a "second", which had some cosmetic flaw. If there is a serial number on the back of the peghead, the "2" is usually seen centered above or below it. Also sometimes stamped was "CULL", which is another designation of a second. Again, this stamp is seen on the back of the peghead. The worse Gibson reject is the "BGN" stamp, designating that instrument as a "bargin" guitar. These were only sold to employees at substantial discounts. This stamp is also seen on the back of the peghead. Sometimes the "BGN" is stamped vertically with the "N" below the "G" which is below the "B". BGN instruments weren't acceptable to Gibson as sellable to the public. "MADE IN THE U.S.A." stamp. 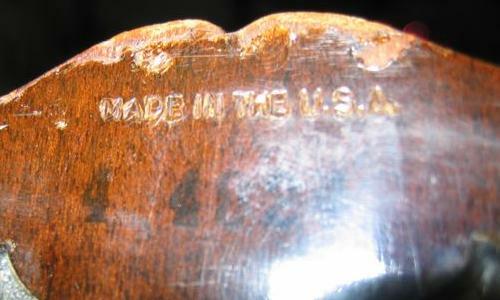 Exported instruments to Canada or overseas prior to 1970 where often marked "MADE IN THE U.S.A." in very small lettering and all on one line. Note this is a different stamp than the one used from 1970 and later that said "MADE IN U.S.A." on two lines, with no "the" and in same size type as the stamp-on serial number. This is sometimes stamped on the back of the peghead (where a serial number would be on 1961 and later Gibsons). Also it's sometimes seen on the top edge of the peghead. Model Body Markings (non-Artist models). After WW2, lower-line Gibson vintage instruments did not have a label to designate the model. Instead, Gibson just ink stamped the model number inside (on hollow body instruments). If the instrument had "f" holes, this number was ink stamped in the bass side "f" hole on the inside back of the instrument. If the instrument was a flat top guitar, this number was ink stamped inside the round soundhole on the inside back of the guitar. Mid to high-end model guitars during the 1930's and early 1940's used a black case with a red line around the top edge of the case. The inside is a deep maroon color. Lower models used black rigid cardboard cases. About 1938, mid to high end model started to use a tweed case with a 3 inch wide red "racing stripe" on the tweed. The inside of these cases are also usually a deep maroon. These tweed cases were used up to WW2. Post-WW2 (1947-1960), Gibson offered 3 different cases. The "low grade" case was an "alligator" softshell case, essentially made of rigid cardboard with a sparse brown lining. This case also often had a hard thin brown plastic handle that cracked very easily. The "medium grade" case was a wooden case with a smooth brown outside and usually a sparse green lining (though different color interiors are seen). The "best grade" (known as the "faultless" case) was the "California Girl" case, as it is known. This wooden case has a rich brown outside (like a tanned California girl), and a very plush and rich pink inside. The handle on the medium and high grade cases was leather covered metal. 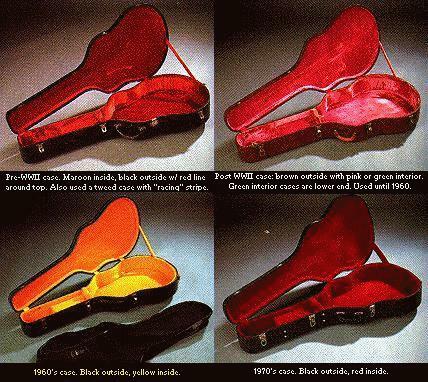 Note some models (such as the Les Paul) did not have a medium grade case available (either got the 'gator case or the Cal Girl case). But the most desirable Les Paul California Girl case is the model with a curved top and *five* latches so it seems. This 5 latch case was sold with Les Paul Juniors, Specials and Standards during the late 1950s. Though any 1950s era of these three LP models could also have a four latch case. 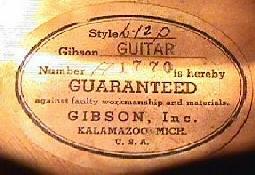 Most 1950's Gibson cases had a small (1.5" by 1") brass plaque on the outside with "Gibson" and a star stamped in it. This was located on the side of the case by the handle. Note during this period there where three different manufacturers making cases for Gibson, all with the same basic specs, but slightly different shapes (Lifton, Geib, Stone). Geib cases are seen mostly in the early 1950's, and Lifton cases in the mid to late 1950's. Stone cases are seen throughout the 1950's, but not to the extent of the other two manufacturers. During the 1960's, the Alligator case was still available for low-end models (SG Juniors, Melody Makers, ES-125, etc.) until 1965. The new low-end case was a black softshell with a plush deep red lining. The medium grade case was dropped entirely and the new high grade case was black on the outside, and yellow on the inside. The black outside changed from smooth to rough during different periods of the 1960's. Also the handle changed from a leather covered metal to a hard molded plastic type about 1963. The small brass Gibson plaque was still used until the later 1960's. In the 1970's, the new high-end case was still a wooden case with a black outside, but a deep red inside. Most 1970's cases had "Gibson" silkscreened on the outside of the case in white. Also made during the 1970's is the "protector" case; a huge thing made completely out of molded plastic. 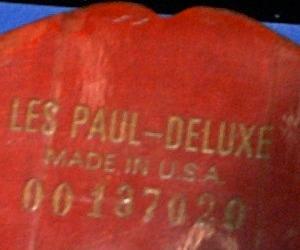 This case was very popular for Les Pauls. 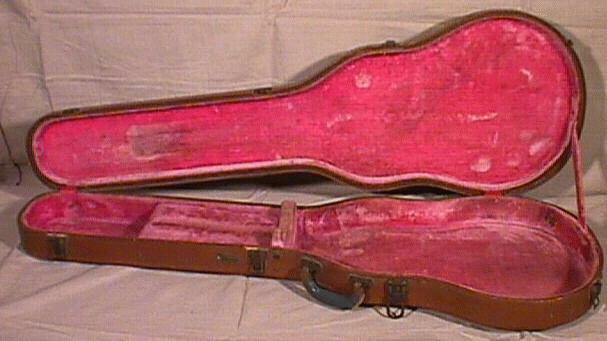 A picture of a mid-1950's Les Paul brown case is here. This is not the most desirable of the Les Paul brown cases, as it has a flat top and four latches (typically this style of brown case was sold with Les Paul Specials and Juniors). Starting about mid to late 1958, the brown Les Paul case changed to a five latch model. This is considered the "Sunburst" case (even though most 1958 models still use the older four latch case). Late 1980's and 1990's reissue cases are copies of the 1950's brown/pink Cal Girl case. These newer cases have a tag on the inside pick pocket that says "Made in Canada". Also, these cases have a pink interior satin cover that goes over the top of the guitar before closing the case. And they also have a combination lock on the main exterior latch and a leather handle. There were also some early 1980's brown reissue cases (mostly for Les Pauls and Korina reissues) that are starker versions of the Canadian reissue case. Most recently Gibson has copied the original 1950's Cal Girl case more exactly on their "historic" series reissues. Gibson Serial Numbers and Factory Order Numbers (How to Find the Year). The easiest way to find the year of a particular Gibson instrument is usually by referencing the instrument's serial number of factory order number. This following information applies to all Gibson instruments including guitars, mandolins, lapsteels, basses and others. This information was compiled from these sources: A.R. Duchossior, W. Carter, G. Gruhn, E. Whitford, D. Vinopal, D. Erlewine. From 1902 to 1976, Gibson instruments may have a serial number, a FON (Factory Order Number or code letter), both, or neither. To make things even more interesting, they sometimes wrote the serial number or factory order number with a near-invisible pencil, sometimes ink-stamped it (in disappearing ink it seems), and sometimes pressed it into the wood. And the placement of these serial numbers and FON's (factory order numbers) can be different, depending on the era. Gibson serial number consistency was never given much thought, as Gibson changed serial number system many times. Hence, some serial numbers may be duplicated in different years. This is especially noticable during the 1960's. Many people ask, "How can I tell the difference between a serial number and a factory order number?". Sometimes this is difficult, but you have to look at the format of the number, and the general era of the instrument. Does it have a pre-WW2 script "Gibson" logo? If so, then just look at the pre-WW2 serial number and factory order number info. This would be the single biggest question to ask, as pre-WW2 and post-WW2 instruments are numbered quite differently. Also, examine the placement and style of the numbers and make sure it follows the schemes described. Another question asked is, "The FON number says the instrument is 1958, yet the serial number says 1959; why are they different?". There is a very logical reason for this. The FON number is stamped on the instrument very early in the manufacturing process. Most times, the serial number is applied as one of the last steps (especially on pre-1961 hollow body instruments) when the instrument is nearly finished. Depending on the demand for the instrument, it could take Gibson up to 6 months to finish the instrument. Hence the FON number could be one year, and the serial number the next year. It wasn't till 1977 that Gibson came up with a good serial number system that will last them indefinately. This new serial number system allows determination of the exact date the instrument was stamped with the serial number, and the factory of manufacturer. Quick Overview: Serial Number/FON Identification by Era. 1902-1908: Often no serial number or model name on label, picture of Orville Gibson and lyre mandolin, date sometimes penciled under the top (must be seen with a mirror). Or serial number and model name on white paper label, number range from 0100 to 99999, hand inked or penciled 1908 to 1932, ink stamped serial number 1932 to 1947. 1908-1930: Factory Order Numbers stamped on neck block inside body. 1925-1931: Some low end models with no numbers. Some models with an ink stamped 3 digit number on neck block. 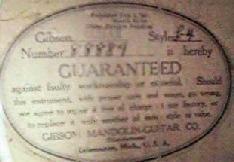 The FONs were issued sequentially and provide a good way to date a Gibson guitar. 1931: FON 4 digit numbers start. 1932-1935: FON numbers "roll over" from 9999, reusing old numbers. Important: this new series of FONs from 1932 to 1935 are *not* in sequential order (pre-1932 they seem to be sequential.) It was like in 1932 the FONs were pre-printed, and someone dropped the pile on the floor. 1935-1941: Factory Order Numbers and Letter Codes. Now FONs contain a letter A to G, ink stamped on the inside back or on the neck block (flattops), or on the label. 1938-1941: Factory Order Numbers beginning with the letter D to H pressed into the back of the peghead. 1947-1952: Factory Order Numbers of 3 or 4 digits, followed by a hyphen, followed by by 1 or 2 more digits, ink stamped on the inside back. 1952-1961: Factory Order Numbers beginning with the letter Q to Z, ink stamped on inside back, all hollowbody models. 1947-early 1955: "A" series serial numbers on a white label, on many models. early 1955-1961: "A" series serial numbers on a orange label, on many models. 1953-1961: Unique solidbody electric guitar "inked" serial numbers. 1961-1969: 4,5 or 6 digit peghead stamped serial number for all models, no MADE IN USA stamped below. 1969-1975: 6 digit peghead stamped serial number, MADE IN USA stamped below. 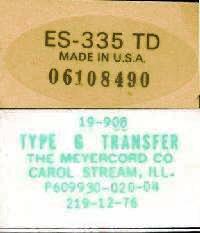 1975-1977: tagged (decal) serial number, MADE IN USA below. 1977-present: 8 digit stamped serial number, MADE IN USA stamped below. 1982-present: Reissue and custom shop serial numbers in various formats. Factory Order Number Configuration and Placement. 1908-1930: Factory Order Numbers stamped on neck block inside body. Pretty much sequentially ordered. 1932-1935: FON numbers "roll over" from 9999, reusing old numbers. Important: this new series of FONs from 1932 to 1935 are *not* in sequential order. It was like in 1932 the FONs were pre-printed, and someone dropped the pile on the floor. Gibson Factory Order Numbers, 1902 to 1945 - Overview. The Factory Order Number (FON) consists of a 3, 4 or 5 digit batch number followed by a 1 or 2 digit sequence number (usually from 1 to 40, but there were some double or triple batches where the numbers were higher). The following are a summary of FONs as documented by Joe Spann in his great book of Gibson FON numbers. Gibson Factory Order Numbers with a Letter, 1935 to 1941.
within the Factory Order Number (FON). letter (and sometimes a space), followed by a 1 or 2 digit sequence (ranking) number. 1935-1937: Letter is between the batch number and the sequence number. Code is ink stamped on the inside back. 1938-1941: two or three letters before sequence number. peghead (for lap steels, impressed into the back of the body). First letter, indicates the year. there is one, is "E" for Electric. Hyphen Factory Order Number with NO Letters, 1936 to 1943. Pre-WW2 hyphen Factory Order Numbers are used mostly on lap steels. The format consists of a three or four digit number, a hyphen, then a one or two digit batch number. Only the first number (before the hyphen) determines the year. after the FON is missing or has faded. Gibson Factory Order Numbers, 1942 to 1951. Serial numbers are seldon found on instruments made during WW2. But most (not all) have Factory Order Numbers (FON). These contain a four digit batch number stamped in ink, followed by a two digit sequence number written in red pencil (during WW2 only). After the war, the red pencil wasn't used (and on instruments made during the war, sometimes it's really hard to see the red penciled sequence number). Usually there is no more than 46 instruments (sequence numbers) per batch. Also no batch number with a "1" as the first digit was used during WW2. The FON is usually located on the neck block. The war-time list that follows is not definative but includes FONs that I have seen. Unfortunately I don't have every range of FON's during this period. 1941    G (letter code sometimes seen after FON, i.e. 2586G). 1942    907, 910, 923, 2004, 2005, 7000ish (i.e. 7119) - all 'Banner' logo. 1943    Range generally 9xx to 22xx, depending on the model. 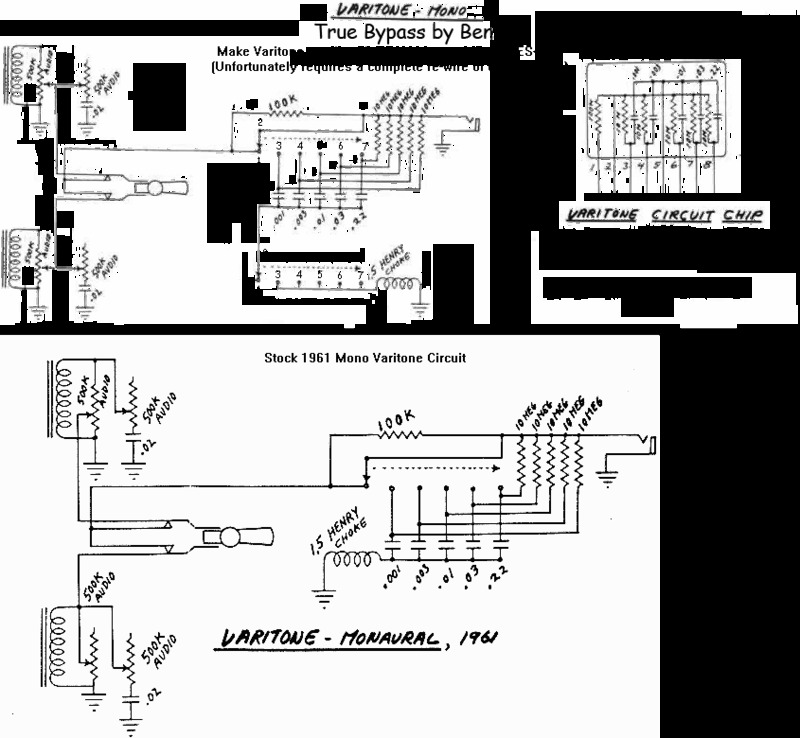 1944    Range generally 22xx to 29XX, depending on the model, some with no FON. 1945    1xx to 10xx, but many with no FON. 1946    n/a ('Banner' logo no longer used, now script logo with no banner). Factory Order Numbers with a Letter, 1952 to 1961. 1902 to 1908: Rectangular label, no serial number or model name on label, photo of Orville Gibson and lyre-mandolin on label, date sometimes penciled under top. 1904 to 1909: Oval label with serial number, no model name, photo of Orville Gibson and lyre-mandolin: 1904 to 1909. 1932 to 1947: Ink stamped, not penciled. 1927 and later: Low end models with no serial number. 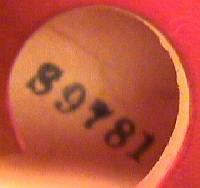 "Artist" serial numbers used on mid to upper line guitars. No serial number used on lower line instruments (date by Factory Order Number). Instruments with an "Artist" serial number should also have a Factory Order Number by which a date can be cross-referenced. Number preceded by an "A-" on white oval label: 4/28/47 to 1/12/55. The first number, A-100, was assigned to an L-7 on 4/28/47. The last white label number was A-18750, used 1/12/55. Note white label numbers A-18751 to A-20000 were not used. Number preceded by an "A" on orange oval label: 1/13/55 to 2/21/61. The first orange label number, A20001, was used on a F-5 mandolin 01/13/55. The last orange label "A" number was A36147, used 2/21/61. Note the "-" after the "A" was dropped for the orange labels. ink stamped numbers in back top of peghead. First number denotes last digit of year, followed by a space and 4 digits, or no space and 5 digits. No space and 5 digits following the year only occured in 1955, 1956, 1959 and 1960. In 1955 Gibson forgot to reset their serial number back to #5 0001. Instead they continued the 1954 series, just changing the first digit to a "5" for 1955. For this reason the serial numbers exceeded "5 9999", hence 5 digits and no space following the year had to be used. Apparently production was high enough in 1956 to exceed "6 9999". 1959 & 1960 production was also very high, exceeding "9 9999" and going to "932000" or higher. 4 or 5 digits impressed in back top of peghead: 1961 to 1964. 6 digits impressed in back top of peghead: 1963 to 1969. All models, "made in U.S.A." stamped-on the peghead, 1970 to present. 6 digits impressed in back top of peghead: 1970 to 1975. Letter followed by 3 digits, custom shop or limited edition models only: 1971 to present. Number on decal: 1975 to 1977. 8 digits impressed in back top of peghead: 1977 to present. White label as used from 1908 to 1932. 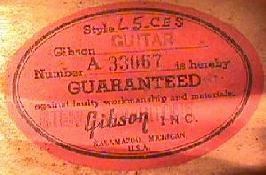 Gibson Non-Hyphen Serial Numbers, 1902 to 1947. Series starts with 1000. Note the format of these serial numbers has NO HYPHEN and NO LETTERS. For a number list with a hyphen and/or a letter, see the previous section under Factory Order Numbers. "A" style serial numbers as used from 1947 to 1961. Right: Orange label as used from January 1955 to 1964. The 1964 to 1969 orange labels are identical, except for the added text "union made". Gibson Serial Numbers for Hollow bodies, 1947 to 1961. "A" series, number on interior label, 1947 to 1961 hollow body models. This "Artist" series serial numbers were only used on mid to upper end instruments. A-18750 (Jan 12, last white label. Left: The "inked on" serial number on a 1955 Les Paul standard solidbody guitar. 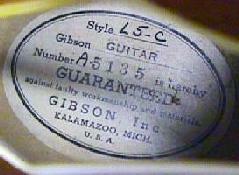 This style serial number was used on all 1953 to 1960 solidbody Gibson guitars. Right: The "inked on" serial number on this 1959 Les Paul Junior has no space between the "9" digit (year) and the rest of the numbers. This happened only in 1955, 1956, 1959 and 1960 when production required a number above "9999", thus occupying the space. Gibson Serial Numbers, 1952 to 1961, solid body models. Ink stamped number on back top of peghead. The first year of Gibson solidbodies was 1952, and Gibson didn't use any serial number in 1952. Starting in 1953, the first number is the last number of the year. If the ink stamped number consists of 5 digits, there will be a space between the first and second numbers (separating the last digit of the year from the actual serial number). If there is a 6 digit ink stamped number, there is no embedded space as the serial number has exceeded 9999 and now occupies the place where the space existed in numbers 9999 and lower. No space and 5 digits following the year only occured in 1955, 1956, 1959 and 1960, and the second digit will ONLY be a "1" in 1955 and 1956. In 1955 Gibson forgot to reset their serial number back to #5 0001. Instead they continued the 1954 series, just changing the first digit to a "5" for 1955. For this reason the serial numbers exceeded "5 9999", hence 5 digits and no space following the year had to be used. Apparently production was high enough in 1956 to exceed "6 9999". Production in 1959 and 1960 was also very high, exceeding "9 9999" and going to "932000" or higher (so a "1" or "2" or "3" could be the second digit in 1959). The Ink Stamped serial number stopped at the end of 1960, though a few 1961 instruments were made with a "1" ink stamped prefix. This is very rare, but seen on a few lap steels (pressed in serial numbers started in 1961 for all Gibson instruments) and a few Les Paul models. One other exception to the above rules is in late 1958 where some Les Paul juniors and specials had a FOUR digit serial (no leading year digit). * In late 1958 some LP Juniors/Specials had a four digit serial number with no leading year digit. Note this style of "Made in the U.S.A." is NOT what is described below. during the 1930s-1950s (this is a 1954 LP Junior). Stamped in serial numbers, used from 1961 to 1969. The 1964 number on the left is still a "pressed in" number, though gibson has inked the impression to make it more readable (they started doing this about 1963 or 1964, when serial numbers went to six digits). The number in the middle is from 1964 (on an ES-335), and the number in the right is from 1961 (on an Les Paul TV Special). Note the lack of "Made in USA", thus denoting these are pre-1970 guitars. Gibson Serial Numbers, Feb 1961 to 1970.
number with "MADE IN U.S.A."
Gibson Serial Numbers, early to mid 1970's. All models, decal, 2 digit prefix followed by 6 digits. The decal can also states the model name/number. 1976 Gibson serial number with "00" prefix. Vintage Reissues and Custom Shop Models, 1982 to present. These models have their own serial number system, and are not covered in this document. Copyright 1995-2004 all rights reserved.